Click on the links to the left to access resources to support parents/guardians, your family, and our entire community as we work together to foster students' success in our district schools. *In inclement weather situations, click here, to see if events will still occur. Course requests for Summer School 2019 are now closed. Summer School Registration was conducted online using the Infinite Campus Portal. Registration and course requesting for summer school was conducted via the Infinite Campus Portal and is now closed. Course requests for Summer School 2019 closed at 4pm on 4/5/19. After the window closes, our team will load the requested courses to schedule students in sections, add any sections where feasible and notify families when courses are full. If you missed the course request window and would still like to enroll students in any classes that still have space, please call the elementary office at 608-635-4347x6. We would love to have your child involved in our summer learning programs and will make every effort to honor course requests but do understand that space is limited for the courses and number of sections we are able to offer. Course offerings and schedules denoted on this document and on the portal are subject to change. Our dates for summer school will be from June 10-27th for our three-week session. We will have swimming lessons from July 8- August 1 during the day and then a night session from July 8th- July 29th two days a week, Mondays & Wednesdays. NOTE: Swimming lesson registration will occur at a later date. The first step to registration is to make sure you have an Infinite Campus Portal Account. Visit this section of our website for more information about obtaining a portal account. Click here to visit our Summer School Registration Information page. Please stay tuned for more Summer School information through email, our website, and social media. Interested in joining our school district? Apply now for Open Enrollment to Poynette Schools. 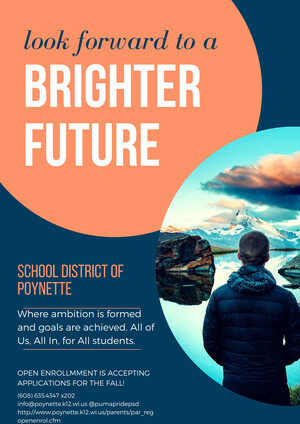 Families from other districts may apply for Open Enrollment into the School District of Poynette now through April 30, 2019. Traditionally, children in Wisconsin are assigned to public school districts based on the location of their parents’ home. Open enrollment is a tuition-free opportunity for parents to apply for their children to attend a public school in a school district other than the one in which they live.The state’s public school open enrollment program is administered by the Wisconsin Department of Public Instruction. Click on the link below to learn how your family can join our community of learners. We look forward to serving you. Join us on March 19th at 5:30pm in the Poynette Elementary/Middle School Gym for a night of family fun! Games, relays and scooter races are all part of this heart-healthy event. Admission is $2, (children under 5, free) All proceeds from the event will be donated to the American Heart Association. The American Heart Association sponsors Hoops for Heart events across the country to raise funds and awareness for heart disease. Join us at this lively event for some priceless entertainment, opportunities to win fabulous prizes and raise money for a great cause. We "hoop" you will join us. Plan ahead for 4K graduation. On Friday, May 31, 2019, our teachers will host the 4K graduation at the Arlington Fireman's Park Pavilion. Students will be recognized for learning. Parents and special guests are invited to attend this special occasion. The graduation and reception will be from 9:00 to 10:00am. Annually, we begin to prepare for the upcoming school year well before your children are out of school for the summer. One aspect of our district preparation is organizing elementary students into their new grade level classrooms. Our guidance counselors, teachers, administration and other trained district personnel take many things into consideration when organizing students into their new classes. These trained staff work on a daily basis with each child and can provide the best insight into next year’s placement. We make every attempt to ensure that class sizes are balanced and each child’s individual academic needs are considered. Our classes should be equitable in size and include students with a variety of ability levels, talents, and needs. No matter where your child is placed, our goal is to provide an environment within each classroom that will make it possible for ALL students to achieve at their highest potential. Gender Ratio: We strive to maintain a balance of boys and girls in each classroom. Class Size: We strive to balance the number of students in each classroom. Variety of Abilities: We strive to have heterogeneous grouping in all classrooms. Students learn from each other at all levels. Special Placements: (Acceleration, Special Education, Remedial Reading, etc.) In order to best meet the needs of children and staff the most effectively students with specific needs may be clustered together. Parental Input: We would like to provide an opportunity for parents to provide information about their child and what is important to them with regard to the classroom environment and their child’s personal characteristics. Parents should not, however, request their child be placed with a particular teacher. This year and beyond we will continue to analyze the aforementioned characteristics for placement. In addition we are seeking important information about your child to help us provide the best learning environment to suit his/her needs. We request that parents complete a Elementary Student Placement form and submit it to the elementary office by early May. Much time and careful thought will be given to each child’s placement whether or not a parent information sheet is received. However, we do want to create an avenue for parents to provide input to us each year with regard to their child. Please know that we make every consideration with the information provided; however, it is not always possible to fulfill every request. Direct any questions regarding this process to Mr. Hausser, Poynette PreK-5 Principal, 608.635.4347x100. Click on this link to learn more about our district&apos;s policy on using this social media resource.